Celebrate the return of gray whales to the Monterey Bay during Whalefest Monterey! Old Fisherman&apos;s Wharf and Custom House Plaza in historic downtown Monterey throw quite the migration party for these much loved creatures during the 2-day festival. This free, fun and educational interactive family event for all ages celebrates the biodiversity of the Monterey Bay National Marine Sanctuary and much more! 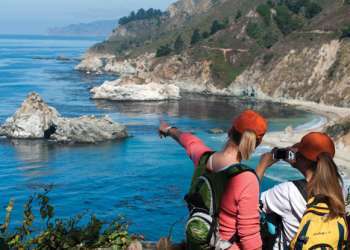 The event, which features a 2-day Symposium with world-renowned marine experts and dozens of exhibit booths, benefits many local and national marine organizations that educate, inspire, and empower the public to protect the Monterey Bay National Marine Sanctuary. The event will run Saturday and Sunday from 10am to 5pm. Want to see these massive creatures on the open sea? Take a whale watching boat tour out of Old Fisherman&apos;s Wharf in Monterey. Click here for a list of local whale watching cruises and information for the first-time whale watcher.